The Green Johanna is a unique closed, hot composting container that allows you to include ALL food waste composting including dairy, meat and bread. Developed and manufactured in Sweden, the Green Johanna is easy to use. It's adjustable, ventilated, insulation system provides ideal composting conditions all year round (when correctly installed), because you can more easily control the temperature of the compost in addition to the mix of composted ingredients. This helps create ideal conditions for the micro-organisms to work, turning all the waste into quality feed for your garden. You may also need the optional winter jacket if you want to compost all year round, depending on where you live. (The jacket is only used if the average outdoor temperature consistently falls below 5 degrees C, and must not be used if the average temperature is above 10 degrees C). The special shape of the Green Johanna also helps to keep the compost at uniformly warm temperatures to maximise the compost process. It's easy to empty too. You can draw the fully broken-down, nutrient-rich compost from the bottom of the composter without disturbing the process continuing above it. Thanks to the lockable lid, the base, and the sensibly small ventilation holes, the composter is rodent proof but beneficial worms can still get in to the mixture. All food waste including bones, bread, dairy, eggshell, fish, fruit, meat, soup, vegetables, coffee filters, teabags, household papers (best torn up) egg cartons, wilted flowers, dead pot plants, leaves, grass etc. Your Johanna is best sited in a shady spot. The contents should not be allowed to get too hot since this can kill off the beneficial microbes breaking down the waste material. 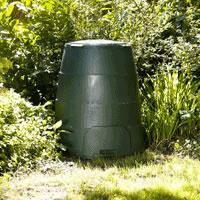 Be the first to submit a review for the Green Johanna Ventilated Hot Composter.